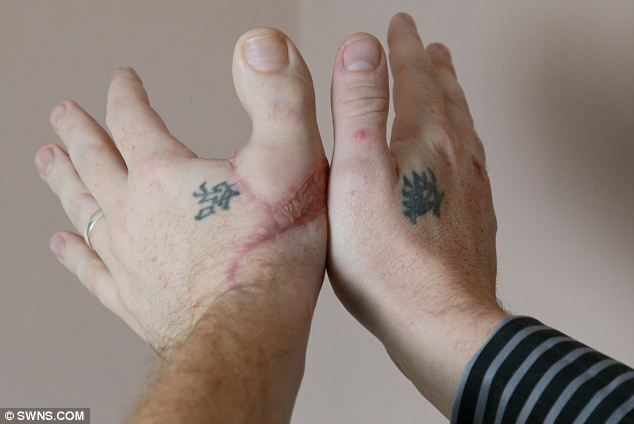 A British man has swapped one his toes for a thumb after he lost his original in a carpentry accident. 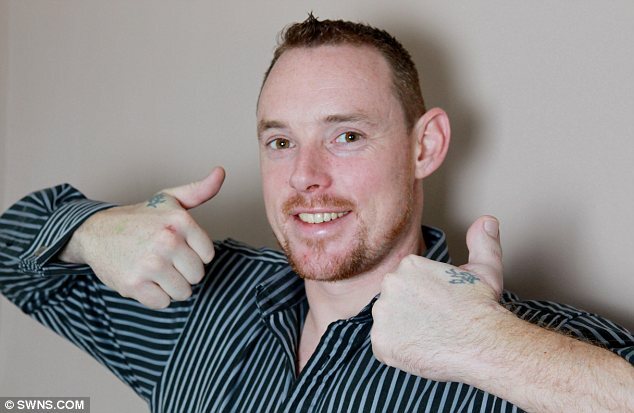 James Byrne, 29, had his big toe grafted on to his hand after he severed his left thumb while sawing through a piece of wood last December. Surgeons had first tried to sew his original thumb back on but the blood would not start flowing again despite months of treatment, including using leeches. So surgeons turned to a bizarre and original solution – they would use his dominant toe instead. They argued that losing a toe would only affect Byrne’s balance in the short term – therefore outweighing the loss to his foot. His consultant Umraz Khan at Frenchay Hospital in Bristol, England, carried out the operation in September. Now, two months after the operation, the paver from Bristol has a working ‘thumb’ – which he has nicknamed ‘Toby’. James currently has limited movement in his thumb but is expected to regain full use of it after intense physiotherapy. He will later have an operation to remove a piece of wire fusing the bones together.James hopes to return to paving job in the New Year and then play rugby shortly after. Frenchay Hospital is a regional micro-surgery centre and has an international reputation for such complex surgery. Mr Khan led two teams of surgeons during the eight-hour operation – with one amputating James’s toe while the other worked on his hand at the same time. Now that was definitely some freaky surgery and a bizarre medical procedure, to say the least! I’ve never heard of a person replacing a lost thumb with a toe… This is very strange looking, but I hope it works out for him in the long run. Geez, I’d hate to play a game of thumb wrestling with that guy; ha!